You may be wondering how to grow an environmentally friendly lawn without spending a fortune. Well there are a few ways to save money while still focusing on being friendly to our earth. 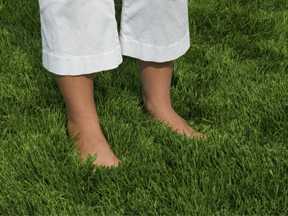 Here is the first part of two installments on how to keep your lawn both low maintenance and environmentally friendly. First, it is key to understand the characteristics of any grass to determine how sustainable and beneficial it will be to the environment. All maintained grasses can provide an area that can be enjoyed by family, including pets, while still providing soil stability. But grass can do more than that. A beautiful green lawn, with the help of trees and hedges, can help reduce the air temperature around a house by 7 to 14 degrees. That can significantly reduce the cost to air condition a home. Even more so, lawns absorb carbon, cleaning the air we breathe. Most every lawn can do this, but zoysia lawns can do it with less water, less fertilizer, less pesticide, less herbicide, and less mowing. Zoysia is also more drought resistant, which ultimately means less watering for it to stay green, even in the heat of summer. Other grasses, which require more watering, can cause run-off of poor quality water into sewers from non-lawn and garden areas such as driveways. This can eventually reach our rivers and streams. But well maintained lawns absorb and filter water. Even more so, Zoysia’s ability to be drought resistant means a reduction in the need for supplemental watering systems like sprinklers. Homes with thirsty grasses can sometimes use up to 85% of the total home water usage in warm summer months. That is quite a burden on the environment AND your wallet. And as water conservation becomes more and more important to a sustainable environment, lawns needing less water will provide the most environmentally friendly benefits. To find out more about how low maintenance lawns can save you money and help the environment, check back soon for Low Maintenance Lawns: Part II. This entry was posted on Wednesday, May 26th, 2010 at 2:43 pm	and is filed under Care & Maintenance, Zoysia. You can follow any responses to this entry through the RSS 2.0 feed. Both comments and pings are currently closed. grass whe it turns yellow? Turf paint does exist, but we do not carry it ourselves. I’d do some research online and see what you can find.